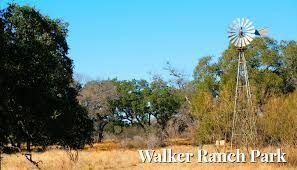 Walker Ranch, added to the park system in 1999, has long been a site of historical significance for this region. The park is part of a larger archaeologically-significant site where hunting and gathering people have lived over thousands of years. It also was part of the Monte Galvan supply ranch for the Mission San Antonio de Valero, later known as the Alamo. The park currently features a 0.5 mile paved exercise trail, about 1 mile of nature trail, playscape and covered pavilions. Fires are not permitted—including BBQ pits and hibachis—and no camping.